104, 108, 112 are the ages of some of Grenada’s Centenarians. Vincent Lett, 104 year old resident of Appres Toute, St David; Leanora Noel, 112 year old resident of Morne Jaloux, Carriacou, and Elaine Estella Pivotte, 108 year old resident of the Mother Theresa’s Home, St David are, according to the Desk of the Elderly of the Ministry of Social Development and Housing, among the oldest persons in Grenada. 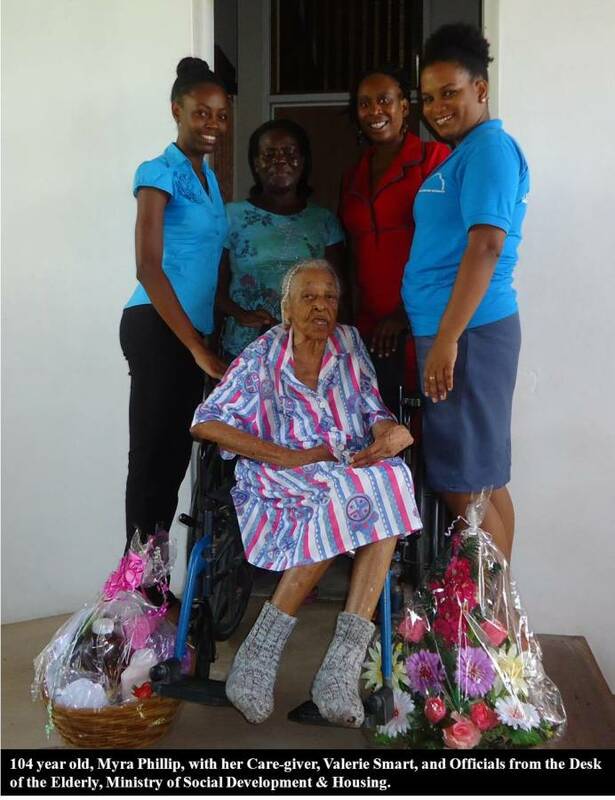 This past Monday, 14 July, officials from the Desk of the Elderly, paid a special visit to another centenarian, St Andrew resident, Myra Phillip, of Riverlett Lane Grenville, who marked 104 years on Saturday, 12 July. Phillip is one of 17 centenarians who have received ‘birthday visits’ from the Desk of the Elderly between the months of January to July, 2014. Back in her days, Phillip co-owned a store in the Town of Grenville along with her sister, who has since passed on. To this day, the centenarian fancies getting ‘dolled up’ in her colourful dresses and jewelry. She also enjoys chatting with visitors. Phillip has ‘adopted’ many children in and around Grenville, and is better known as ‘Aunty’ by most. She was all smiles and hugs when the ministry officials stepped into her sitting room bearing a gift basket and flowers which immediately caught her eye. At her age, she boasts of a clean bill of health, save occasional sight problems. During the day, Phillip enjoys listening to the Harbour Light Radio station and reading her favourite book, the Holy Bible. Valerie Smart, her caregiver for 6 years says that Phillip has a very good appetite, her favourite foods being macaroni pie and cake, both of which she had on her birthday. Smart said she truly values the time spent caring for Phillip. “I actually miss her when I go home,” she said, smiling.